An American travel writer living in Paris, Gabriel Prince, is approached an eccentric scientist with a bizarre proposition. Jasper Hudnut, has access to a "borrowed" time machine and wants Gabriel to travel back in time an eliminate what he believes to be one of the 20th Century's most evil rulers - Ronald Reagan. No assassination attempts here, Hudnut simply wants Reagan to stay out of politics and lessen his chance to become President of the United States of America in the 1980's. The plan is to travel to pre-World War II Hollywood and intercept the young actor Ronald "Dutch" Reagan and derail his career in politics. Gabriel soon learns that changing the past is a tricky business and that there are far more pitfalls than he had anticipated. Including falling in love with a Hollywood starlet; befriending Reagan; and that staying one step ahead of the owners of the time machine who are desperate for its return. What can you say about a book that takes a tired time travel cliché, namely using a time machine to eliminate an "evil" world leader - usually Hitler, and focuses it on a new target - Ronald Reagan? Inspired? Hilarious? It should be both, but somehow manages never to balance the seriousness of the mission with the comedic elements that the author Peter Delacorte interjects into the novel. The full title of Peter Delacorte's novel "Time on My Hands - A Novel With Photographs" suggests that Delacorte was striving for loftier ground achieved by Jack Finney in the classic Time and Again - An Illustrated Novel [Click for Review]. Where the illustrations included Finney's novel succeed in illuminating the story and sheding light on an era unfamiliar to the reader, Delacorte's snapshots of Bogart, Reagan and other Hollywood scenes don't work nearly as well. I am not sure whether it was because I found it hard to believe that the photos had actually been take by Gabriel Prince or perhaps it was because the photos were lacking captions and somehow felt divorced from the action of the story that I somehow sensed the artifice. Time on My Hands does manage to cover a lot of interesting ground including the Hollywood Studio system of the late 1930s and early 1940s with cameos by director Howard Hawks, and a number of studio stars. Delacorte also explores the politics of the 1980s and what it might have been like had Regean not been made President. While it all makes for an entertaining read, Delacorte has difficulty deciding on how his particular brand of time travel works and sticking to it. When Gabriel arrives in the alternate 1984 he looks up Jasper Hudnut who explains the possibilty of alternate timelines. "Timelines, Gablriel," Hudnut said. "An infinite number of time lines running parallel to infinite length. In the one you left, the Actor was still president, will always have been president, and Annabel and I went our separate ways. In this one, he was never president and we've been married for eleven years." [Gabriel] digested. He considered. He said,"So every time I used the machine every time anyone uses the machine, he jumps from one timeline to the next?" This explanation is fine except that later in the book the author appears to contradict himself when he suggests that one timeline ceases to exist when someone travels back in time to change the course of events. During a meeting between Gabriel (the time traveller) and Lorna (a person from the past) Gabriel discusses travelling back in time to undo an event. Either the past is immutable or it's not. Just because Prince changes timelines, shouldn't mean that any of the other timelines should suddenly disappear in a puff of thin air. 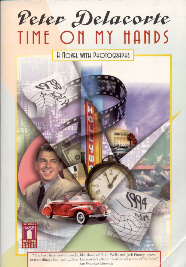 A flawed, but entertaining novel, Peter Delacorte's novel "Time on My Hands" gives readers a glimpse into the Hollywood studio system of the the late 1930s while exploring an interesting "What if?" scenario. This site courtesy of the publishers includes a brief synopsis of the novel as well as some high school like discussion questions. If you like time travel involving hollywood and movie stars, I recommend you check out Joshua Dann's Timeshare series of three books Timeshare (1997), Timeshare - Second Time Around (1998), and Timeshare - A Time For War (1999). The series has cameos by John Wayne, Humphrey Bogart, Ronald Reagan, Bugsy Malone, Dorthy Parker and many more.